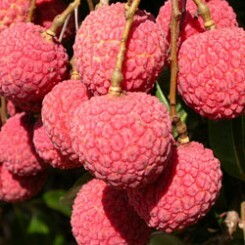 Lychees have been cultivated in their native southern China for centuries. Their popularity has seen them spread worldwide for commercial cultivation. They were introduced into Australia in the 1870s by Chinese gold seekers. It is Chinese tradition to offer lychees as a New Year good-luck charm because they are considered a symbol of romance. Lychees are oval to round, depending on variety, and measure about 3 cm in diameter. They have a leathery, scaly, skin, which ranges in colour from pink to red. The flesh is semi-translucent, firm and jelly-like, containing a shiny brown seed. The Australian lychee industry is unique in having the longest lychee production season in the world. Due to the introduction of earlier and later fruiting varieties, and the extensive production zones from tropical to temperate climates, the industry produces fruit from October in Far North Queensland to early April in Northern NSW. This gives the Australian industry a significant advantage over our competitors on world markets. 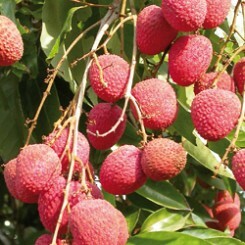 No other country can offer such a long line of supply of a quality-controlled fresh lychee product. 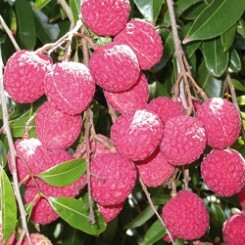 This is the first variety of lychee to be cultivated in Australia. It is becoming more readily available. Available from October to November. Fruit has a deep red colour with a smooth thin skin. The fruit is round in shape and the size will vary as the fruit matures. The flesh is sweet and juicy with a good flavour. A late fruiting variety that grows in South-East Qld and NSW. 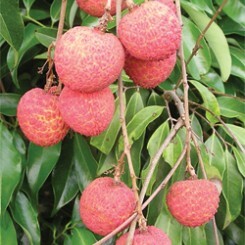 This is a Thai variety that is a good eating fruit. It is also large and red with a smallish seed. Available from December to January. A relatively new variety that is in limited supply. It is a large red fruit with a small seed. Available from November to December. Developed in Australia, they are bright red with a smooth skin but are small with a very small seed. A pretty red colour when ripe, they are a lovely eating fruit with a similar taste to B3. Available from mid November to mid January. A large fruit with a sweet taste that is picked with some green mottling on the skin. Available from November to December, it is extremely difficult to get commercial crops on a regular basis. 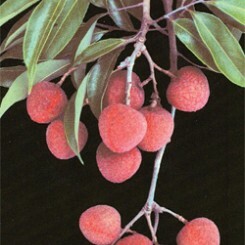 A classic lychee with a bright red skin and large seed. Available from December to January but are in limited supply. 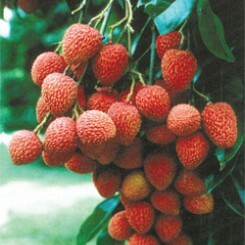 A great eating lychee developed in Australia with a small to medium seed. Available from late November to February, they have a red skin with a slight orange hue and tend to be more round. 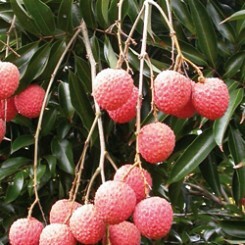 The lychee (Litchi chinensis) is a subtropical fruit. It is oval to round in shape and about the size of a walnut. Its thin, red bumpy skin is easily peeled to reveal a white, juicy, translucent ball of firm jelly-like flesh that surrounds a shiny brown seed. 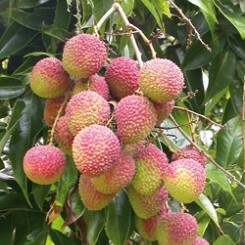 Lychees are berries and are produced on tropical evergreen trees. The trees are attractive with shiny, leathery green leaves and long sprays of green, white or yellow flowers. After a few months, the sprays of flowers become bunches of fruit. Once ripe, the bunches of fruit are harvested by hand. After harvest, fruit are graded and packed, ready for delivery.